SLEEPS 6 BATHROOMS 1 BEDROOMS 2 Two Queen size Beds, one sofa bed for up to 2 persons. Casa Liana 2br/1ba It can be rented together with "Casa Liana 1 bedroom/1 bathroom" as one big apartment for up to 6/10 people. The apartment offers very comfortable accommodations with contemporary furniture, and lots of modern character. It's composed of two double bedrooms, 1 bathroom, open plan living area including pull out sofa bed, flat screen TV, A/C, self catering kitchen with dishwasher and washing machine, together with a wonderful private terrace equipped with table and chairs. It's conveniently located at the 4 floor of a modern building of 5 floors with an elevator. The Sorrento main square is only 300 mt. away. Less than 200 mt. from the apartment, you'll find shops, supermarket, bar, ATM, Internet cafe, Restaurants, etc..
Air conditioning and heating,WiFi internet and welcome pack are also included included. Car not needed, Parking is available at extra price of € 15/day. Just a short walk from the apartment, you'll find a bus stop (100 mt away), a train to get to Pompeii (300 mt away), the port to get to Capri and Naples (500 mt away), shops, supermarket, etc. (200 mt away). All you may need is a step from your door. 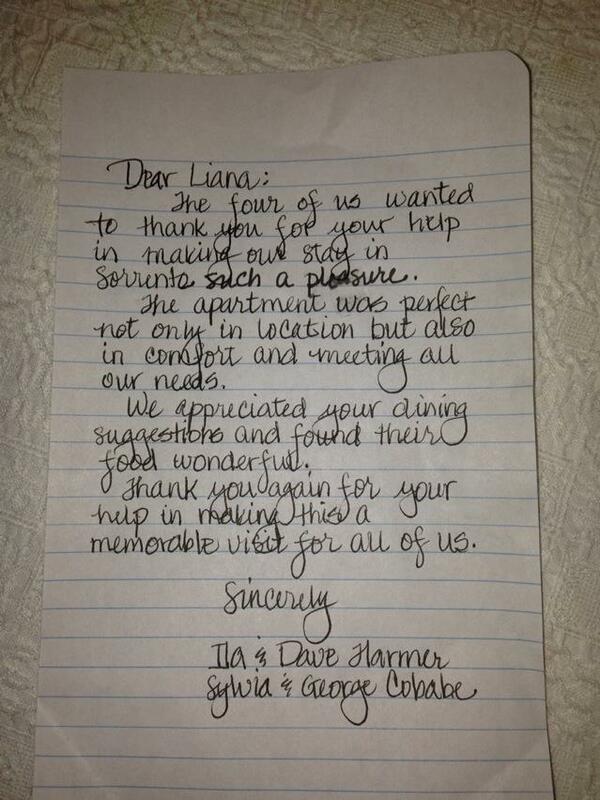 My family and I were thrilled with our stay at the 2-bedroom Casa Liana. The location couldn't be better - within walking distance of everything we wanted to see in Sorrento, including the Piazza Tasso and the train station. The view of the Sorrento rooftops and Mediterranean was enchanting. The apartment itself is beautifully furnished, very bright, sleek, modern and clean. It was perfect for two adults and two children. Upon our arrival, we were greeted warmly with a goody basket full of pastries and candy and the provisions in the refrigerator were much appreciated (especially the limoncello!). We were provided with a helpful information book and a very useful map of Sorrento, for which we were quite grateful. There are multiple thermostats in the apartment, ensuring everyone can keep his/her room at the desired temperature. We were always comfortable. It is on a main street running through Sorrento and I have to say the street is incredibly noisy and busy. The noise level is much lower if you close the doors at night; however, we enjoy sitting on the balcony, so the noise was a drawback for us. The kitchen could use a few more things - most notably for us, there didn't appear to be any baking pans and I wasn't even going to try to figure out the coffee pot. Bruno, the booking agent, was incredibly helpful from start to finish. He patiently answered questions for me, made restaurant recommendations, helped me book transportation and even booked a babysitter for us. The only reason I did not give Casa Liana five stars is because of a transportation snafu on the morning we left. The driver that I had booked through Bruno did not show up at the appointed time. It was 3:00 a.m. because we had a 6:15 flight out of Naples and by 3:30 I started to panic, as the Naples airport is an hour away. After several phone calls and some hyperventilating by me, Bruno came through and another driver arrived at 4:15. We did have a death ride to the Naples airport (think hilly, twisty roads with hairpin turns) but by some miracle, the driver got us there on time. Overall, I highly recommend Casa Liana for an affordable, convenient apartment for people who don't want to rent a car in Italy. I wouldn't hesitate to stay there again, but I would definitely double and triple-check to make sure the driver knows when to pick me up! Amazing Views of Capri and Vesuvius from large balcony !